Why Learn Kitesurfing at Double Island? Here at Pacific Watersports, we have searched (on our kiteboards!) 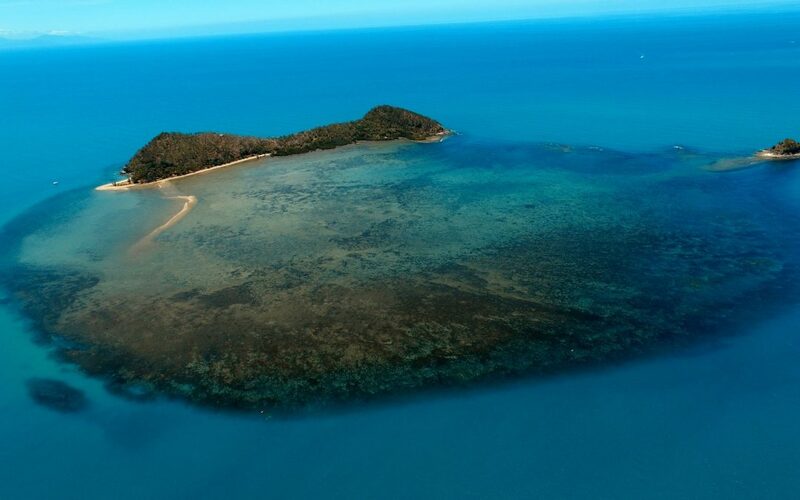 the coast of Far North Queensland for the best locations and conditions to learn to Kite Surf. We are confident that we have found the creme de la creme of kitesurfing locations to teach our students at – Palm Cove Beach, Yorkey’s Knob and Double Island. We are passionate about sharing this awesome sport with as many people as we can, and with these amazing locations, you are set to have a mind-blowing time as you learn to kiteboard with Pacific Watersports. 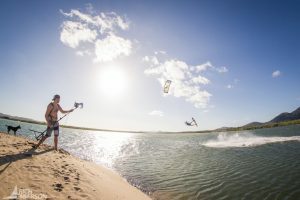 Double Island is our newest kiteboarding location, and in this article, we will explain to you why it is the one and only place to learn to Kite in FNQ. Double Island is 1km off the coast of Palm Cove, so we take our students over to the island by boat from Palm Cove beach. It’s a beautiful place, fringed with coral reef and mangroves on the south side and beaches and caves to explore on the north side. Kitesurfing at Double Island is truly amazing! Drone image we took of Double Island. Why is Double Island the perfect place to learn to kitesurf? The wind is a lot more consistent- especially early in the season – May June and July. Because it’s 1 km off the coast and the trade winds blow more from the south early in the season, we get cleaner, stronger and more consistent winds at Double Island than on the coast. This makes it the perfect place to learn to kite. Kitesurfing lessons don’t have to stop and start as they may have to on the coast when the wind changes direction slightly, meaning we get more continuous practice time. There are a lot of flat water lagoons around Double Island – perfect for beginners or people that want to practice freestyle kiteboarding. These lagoons are created by the fringing coral reefs around Double Island. Flatwater is much easier to work with when we are first introducing the board to our students, and they love the flat water spots surrounding Double Island. It’s absolutely beautiful here. There are only a handful of spots on the planet where you can learn to Kite Surf amongst tropical islands and in beautiful warm waters. The warm climate here in Far North Queensland means you only need to wear a thin wetsuit or ‘shortie’ in mid-winter! And the rest of the year you can get away with t-shirt and board shorts! 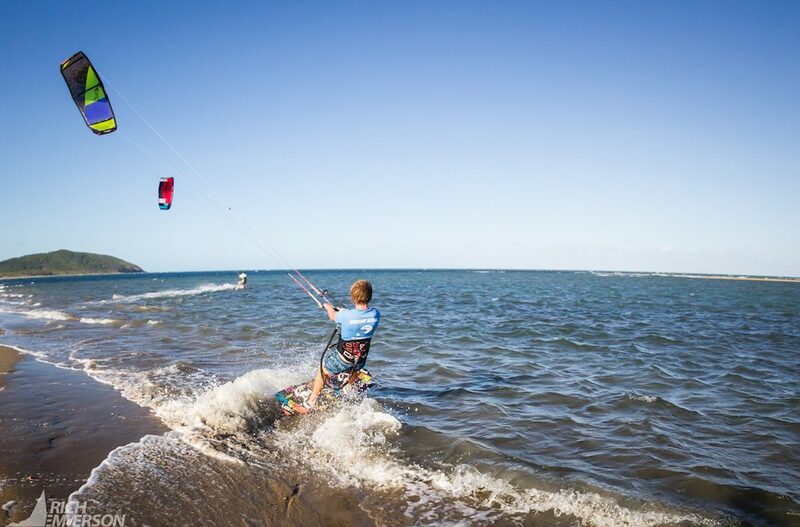 Surrounded by palm trees, golden sandy beaches and a year-round holiday vibe, Palm Cove and Double Island are the perfect places to learn to kitesurf. 4) It’s part of the Great Barrier Reef. It’s part of the Great Barrier Reef Marine Park. How cool would it be to learn to kitesurf on the biggest coral reef in the world? On days without wind, you can snorkel in this spot and see amazing marine life- including turtles, rays and reef sharks. Contact us and come and learn Kitesurfing at Double Island with us! You won’t regret it. Here at Pacific Watersports, we offer 2 awesome adventure tours out to Double Island. We have our Kayak Turtle Tour and our Island Hopping Tour. 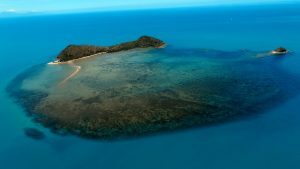 Within both of these tours we go turtle spotting, spending time looking for these awesome sea creatures around Double Island Reef and Haycock Reef which run along the south side of Double Island. There are two main species of turtle that can be found at Double Island, the Green Turtle and the Hawksbill Turtle. In this blog article, we will share with you a little more information about these turtles, so you are full of cool facts before you come on a Kayak Turtle Tour or Island Hopping Tour with us! Green Turtles are only 5cm long when they are born (how cute?!) but can grow to a whopping 1.5m in length. Fully grown, they weigh between 65-130kgs, meaning they are the largest hard shell sea turtles in the ocean. Although they are called Green Turtles, their shells come in many different colours – including green, olive, brown and even black. Why are they called green turtles then? They are called ‘Green Turtles’ as they have a thin layer of green fat which lies underneath their shells. It is thought to be green because of their vegetarian diet of sea grasses and seaweeds. The green turtles feast of the sea grasses and sea weeds around Double Island, so we often see them as we are cruising over Double Island Reef. Green Turtles can spend up to 5 hours at a time resting underneath the water. When they are more active (travelling or feeding) they will come up for air every few minutes, which is when we usually spot them as we paddle over the reef in our kayaks to Double Island. We usually see them popping their little heads up to take a breath, or cruising underneath the kayaks in the shallower waters of the reef. Double Island Reef and Haycock Reef are the perfect environment for these turtles. There is plenty of food here, and areas for them to seek shelter to rest. Green turtles population has been greatly threatened in recent years and they are now considered an endangered species. Poaching, taking their eggs, fishing (turtles often get caught in the fishing nets), pollution and loss of beaches to nest on, have all contributed to the decline in Green turtle numbers. Here in Cairns we have the Cairns Turtle Rehab Centre which is dedicated to the rehabilitation of sick and injured turtles. They rely completely on donations from supporters and volunteers, so if you would like to find out more and donate to this important cause, follow the link below. Hawksbill Turtles are named after the Hawk due to their beak-like pointed mouth. They use their beak to find food in the cracks and crevasses of coral. Hawksbill Turtles can be mostly found in shallow waters of coral reefs, mangroves, tropical islands and shallow coastal areas. They have a very particular diet, pretty much exclusively eating sea sponges from coral reefs. They are very important for the health of the Great Barrier Reef, as without their appetite for sea sponges, coral reef can become suffocated when the sponges grow too big. Hawksbill Turtles are now classed as being critically endangered. Their beautiful speckled shells are used in products displaying ‘tortoise shell’ and many are killed every day. Although it is now illegal to poach a Hawksbill turtle for its shell, many people still do it, and shells are sold on the black market. We can help by not buying anything with tortoise shell, and spreading awareness of this problem. It’s amazing that although they are both endangered species, they are flourishing at Double Island and we get the opportunity to spend time with these amazing creatures in their natural habitat. The beak of the Hawksbill Turtle. Our Kayak Tours leave daily. Book Here! Hi Everyone, here is where you purchase your photos from your tour. If you have already paid for the photos, please use the voucher code supplied when you check out. that will credit you for the value of your purchase. ENJOY!